It is intended for cargoes and personnel transportation and protection providing against small arms and NBC. 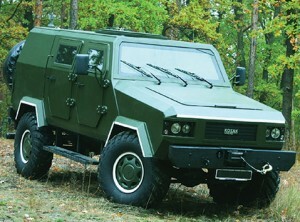 It may be used for equipping of special units of the Armed Forces and quick-reaction forces as a transporta- tion means or as a carrier of any weapon and military equipment and can be operated for fulfilment of military and peacemaking missions both on motor roads network and in cross-country conditions. to provide fire support for these units in combat operations. 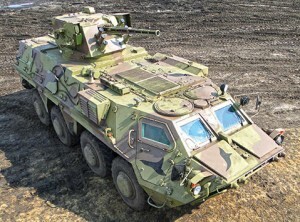 The BTR-4 is intended to equip mechanized infantry units that can fulfill operations under various combat conditions, including NBC environment. Design is based on a modular structure selected to give the maximum flexibility for multi-purpose operation. The weapon station is equipped with armament system including 30mm automatic gun, 7.62mm co-axial machine gun, 30mm automatic grenade launcher, anti-tank guided missiles system installed on the platform stabilized in two planes. Weapon station is equipped with opticaltelevision sight system. Information is displayed on the gunner’s and commander’s monitors arranged on working stations of armoured vehicle chassis. Remote-controlled system and outside combat module provides enhanced protection of the inhabitants, better conditions in the inhabited compartments (weapon station is outside that avoids gas contamination). 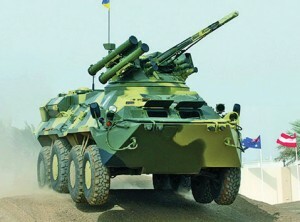 It is intended for transportation of personnel of motorized infantry sub-units and its firing support in combat conditions. It is intended for reconnaissance purposes carried out by special or peacemaking subunits. The Universal or Pickup versions may be used for cargo and staff transportation, as well as a medical vehicle and commander vehicle. It may be delivered in Basic, Universal and Pickup versions. 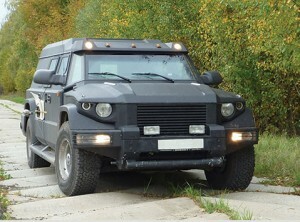 Special armored vehicles customized for both military and civilian use. Vehicle’s platform is created using components from USA manufacturer General Motors for GMC Sierra, Shevrolet Silverado 2500 (3500) — full-size pickup trucks. 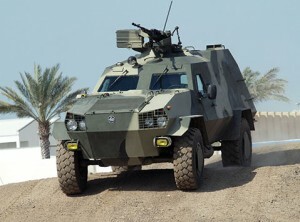 KOMBAT T-98 is the fastest heavy armored all-road vehicle in the world. Protection capabilities from level B2 to the highest B7. Independent front suspension with torsion bars and stabilizer bar. Maximum speed of the vehicle with 17” wheels — 180 km/h. It reaches 100 km/h in 10 seconds.